Advertising agency McCann Sydney has teamed up with Octagon and Digital Arts Network Sydney to create a new campaign that establishes Mastercard’s sponsorship strategy as the official payment partner of the Australian Open. 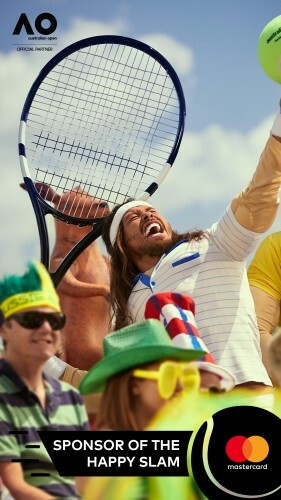 The campaign aims to bring home viewers and tennis fans closer to the tournament via various digital, social, outdoor and onsite activation elements supported by former tennis stars Lleyton Hewitt, Martina Hingis and Jim Courier. The campaign includes the first ever Australian Open of ‘Tap Tennis’, a digital and onsite tournament that allows tennis fans to compete in a virtual game of tennis. Tap Tennis players will compete across the digital and onsite activations to win a trip to the Australian Open, where eight finalists will compete in a championship match on court via a custom-built, oversized interactive Tap Tennis table on Australia Day at Melbourne Park. Tap Tennis players can qualify for the championships through a series of mobile-first HTML 5 Canvas mini-games that challenge them to prove their speed, agility and reaction skills. Finalists will be given the full sports star treatment with return airfares, five-star accommodation at the Grand Hyatt and spending money courtesy of Mastercard. In collaboration with Digital Arts Network, a ‘happiness meter’ has also been created and to track the levels of happiness at the Open and be used to unlock ‘Priceless Surprises’ as well as offers delivered online and onsite. McCann Sydney managing director Adam Lee said The Australian Open is known for its fierce competition on-court, but also for the surrounding atmosphere. “It’s so Aussie – fun, laid-back and light-hearted,” he said. “It’s really social – it’s actually known colloquially as the ‘Happy Slam’. Sarah Pike, head of marketing at Mastercard Australia, said it was a natural fit for the company to be amplifying happiness at the Australian Open. “Happy experiences last a lifetime, and it’s actually what we’re best known for here at Mastercard – providing access to new and priceless experiences, particularly through technology,” she said.